KJW certainly prides itself on its full-metal offerings, and the KC-02 is no different. 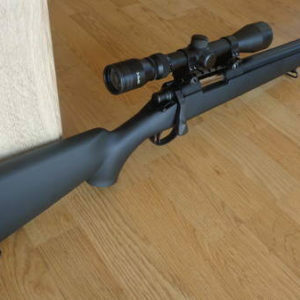 Whereas other snipers stick to plastic externals, the KC-02 rocks a construction that withstands bumps, abrasions, and repeated abuse. The rifle is more compact and has a carbine form factor though, so it likely will be easier to maneuver with. This will help cut down on accidental damage. 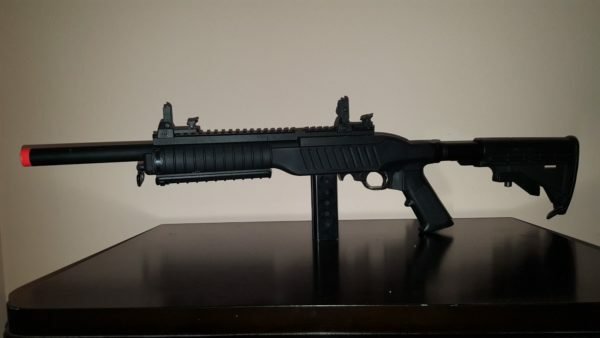 The KC-02’s rails are durable and accept a wide variety of accessories. Whereas other airsoft snipers might be outfitted with conventional optics, KJW’s offering allows for more tactical accessories. With this versatility, the KC-02 is suitable for both long and mid-range engagements. Included pop-up sights can be removed in favor of other parts. It features a 30-round magazine. The rifle comes with a speed loader, but this isn’t necessary. The magazine is similar in design to a typical pistol magazine, making hand loading simple and quick. The KC-02 features a gas blowback action that boasts big-time accuracy. Keep in mind that this airsoft rifle is built for .28g and heavier BBs. The hop up system will not reliably handle lighter rounds, but you probably shouldn’t be using those anyway. The KC-02 excels in a plethora of environments when using weightier rounds. Since this hop up twists endlessly to the top of its thread, it can fall off if you aren’t careful. CO2 magazines are available and green gas is standard. These magazines can suffer from some problems, unfortunately. They can overfeed on occasion and, given their relatively-small capacity, can deplete quickly. Cocking the bolt handle again is necessary to fix these issues. Be mindful of this and carry more ammunition, especially since the KC-02 is semiautomatic. The blowback action is pronounced yet light, an accurate representation of the real deal. The action lever can be somewhat flimsy, especially after multiple uses. However, it’s readily accessible and easy to operate. The rifle shoots true to target and with good velocity. FPS will taper off proportionally according to BB weight, so depending on range, upgrades might be in order.